This condenser microphone is in good condition and fully operational. 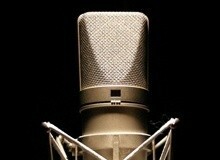 ADK S-51 microphone. In excellent condition, close to like-new. Please feel free to contact me with any questions. Thanks for looking! This microphone is in perfect condition, and comes with original box, shock mount, manual and packaging. Mint condition Neumann TLM102 microphone with clip and original box.This mic was used very little, and when it wasn’t used it was kept in the box away from dust and wear. Excellent condition. Comes with mount. Great deal! Mint condition. Used about an hour demo. Priced to sell. Like new really. Works perfectly. Just upgrading my studio setup.